Although Aleister Crowley (1875-1947) has been the subject of numerous biographies, criticisms, and works of homage, his legacy has largely been defined by his personality. This fact is, of course, no surprise. Calling himself the “Beast 666” and labeled the “Wickedest Man in the World,” Crowley vociferously proclaimed a “new Law” of liberation and human empowerment (Thelema, Gk. “will”; Crowley’s “Do what thou wilt”) that required throwing most social and moral conventions to the wind. Those writers who try to “explain” the Beast and his Law often feel compelled to defend or to deride his lifestyle and his magical system based on their own acceptance of occult doctrines. Kenneth Grant and Hymenaeus Beta, both occult practitioners and Crowley editors, exemplify the sympathetic camp, while John Symonds, also a Crowley editor, speaks for the critical camp. Caught in the shadow of the Beast, these writers and the wide body of Crowley readers have greatly overlooked the other side of his career: his prolific work as a poet, playwright, artist, and essayist. J. F. C. Fuller’s The Star in the West, Charles R. Cammell’s Aleister Crowley: The Man, the Mage, the Poet, and J. F. Brown’s “Aleister Crowley’s Rites of Eleusis” are notable exceptions in their treatment of Crowley’s writings. However, they often tend toward panegyric (Fuller, later a disciple of Crowley’s) or negative judgment (Cammell, his friend late in life) of Crowley the man as well. As a result of Crowley’s cultic status and, admittedly, his almost nugatory influence on later literature, his artistic techniques have gone mostly uninvestigated, both on their own and in relation to his magical/prophetic efforts. When Crowley states that “All Art is Magick,” he essentially defines the aesthetic sentiments lying at the core of his system of magic.1 Thus, the body of Crowley’s writings provides an equal wealth of material for those interested in esoteric traditions, cultural studies, and literary criticism—not to mention psychology. A particularly important development in Crowley’s overall work is his marriage of “traditional” ritual and drama; by drama, I refer to plays blending scripted action with poetry, music, dances, and so forth, usually intended for performance. After taking part in magic rituals as a member of the Hermetic Order of the Golden Dawn and writing occult-influenced dramas, Crowley eventually came to see the usefulness of integrating the two genres or forms more explicitly as a means of personal work and of communicating his message—of preaching the Law and teaching magical wisdom. Although The Rites of Eleusis is the only theatrical production of what he came to call “dramatic ritual” aimed at the general public, this mixed method permeates much of his subsequent theory and practice. By combining the two genres into a single “dramatic ritual,” Crowley sought to create the enthusiasm necessary for magic—which drama did most effectively for nearly all personality types—and, through that liberated ecstasy, to prove the validity of Thelemic principles. The Golden Bough also influenced the Cambridge Ritualists—Jane Harrison, Gilbert Murray, Francis Cornford, and Arthur Cook. This group of scholars further developed the study of ancient ritual and its intimate tie to drama (specifically in Greece) in the first two decades of the twentieth century. Jane Harrison’s Ancient Art and Ritual, in which she claims that art and ritual “have a common root, and that neither can be understood without the other,” is a good example of the group’s interests.6 Harrison also states, “It is at the outset one and the same principle that sends a man to church and to the theatre.” As we shall see, Crowley expressed and developed nearly the same view and during the same time, the first two decades of the twentieth century, though he does not specifically cite any of the Cambridge Ritualists. The social context of Crowley’s early years, then, was one in which ritual and drama were by no means occult, hidden subjects of debate. While questions of authorship, validity, and so forth inevitably come up with regards to The Book of the Law, I want to focus on the role Crowley believed he had been given and the central doctrines that he was compelled to teach. Nuit names the chief officer of Thelema “the chosen priest & apostle of infinite space […] the prince-priest the Beast,” who is accompanied by his consort “the Scarlet Woman”; later, in verse 32 and subsequent chapters, the Beast is specifically called “prophet.”16 Like any good prophet, the Beast (Crowley) needs a message to prophesy. Thus, Nuit gives him “The word of the Law,” Thelema, and explains that it means liberation under the aegis of true Will: “Do what thou wilt shall be the whole of the Law,” for “The word of Sin is Restriction.”17 Moral, sexual, and social freedom to be what you truly are is humanity’s new raison d’etre, though with a maintained respect of others as equally independent and free beings. Also like any good prophet, the Beast has a task set upon him by the god(s) for whom he speaks: “He must teach” the new arts of magic in accord with the new Law, which are laid out in each chapter by the particular god.18 But Nuit gives one crucial statement about those rituals, the Law, and the Beast’s task: “the rituals shall be half known and half concealed: the Law is for all.”19 That is, Crowley was not chosen to hide the Law of Thelema within a tiny group of initiates only; he was, by express order of the gods, to promulgate the Law to all of humanity in “half concealed” rituals, to free them from “Sin” in accordance with the rule of the liberated child ruling the world. The only stipulation was that each individual had to pass through the various “ordeals” that would prove their rejection of the old law and bring them to know their true will.20 This is an important point, especially when we see the shocking amoral and violent content of chapters II and III—“Therefore strike hard & low, and to hell with them, master!”21 To find freedom, to come into the realm of the gods (i.e., humans become gods), each individual had to actually work through the difficult process of finding his/her true will through the necessary ordeals. These ordeals (of initiation) were the responsibility of the Beast. Fulfilling this prophetic task eventually became, for Crowley, a twofold endeavor. First, as he had been told in the days leading up to The Book of the Law, the Golden Dawn was “to be destroyed, i.e., publish its history & its papers.”22 But as an initiated member of the Order, he knew that “The slightest breach of my oath meant that I should incur ‘a deadly and hostile current of will, set in motion by the Greatly Honoured Chiefs of the Second Order, by which I should fall slain or paralysed, as if blasted by the lightning flash.’”23 Luckily for Crowley, the Secret Chiefs “released me from my obligation of secrecy” and, partly because of his “literary ability,” made his “chief duty […] to publish the Secret Wisdom of the Ages.”24 Crowley thus set about publishing the grade rituals and other important papers in The Equinox in 1909, though he had to first undergo and ultimately win a lawsuit by Mathers to halt publication. Added to the earlier schism in the Golden Dawn, the publication of its secrets was a serious blow to its operations at the time. Having received the Law and its concomitant demands on him as the Beast, Crowley at first struggled with the shocking ethics that Ra-Hoor-Khuit brought with him. In Confessions, Crowley recounts his difficult years of coming to terms with The Book of the Law and how he “tried to forget the whole business.”27 Besides the harshness of Thelemic ethics to stubborn “non-believers,” Crowley could not accept the idea of opening up the secret wisdom to the world at large: “I was still obsessed by the idea that secrecy was necessary to a magical document, that publication would destroy its importance.”28 Thus, he determined to publish it out of pure spite—except that “the manuscript had been lost!”29 Crowley’s complete conversion, his acceptance of the Law and of his role as prophet, came in 1909 with the “miraculous” (as he recounts it) rediscovery of the manuscript at his home in Scotland, after which point he dutifully began preaching the word in every way that he could.30 “I further resolved uphold the dignity of Magick by pressing into its service science and philosophy, as well as the noblest English that I could command, and to present it in such a form as would itself command respect and attention.”31 In September of that year, number one of The Equinox (1909-1913)—a variorum of occult poetry, plays, fiction, essays, teachings, etc.—came out to serve as his major vehicle for this endeavor. The diversity of the contents, as Lawrence Sutin comments, reflected “Crowley’s view of magic [that] held that artistic expression was one measure—a fitting one—of true attainment.”32 However, Crowley also recognized that actual work, not just publishing on his end and reading/studying on the public’s end, was required for individuals to thus attain in their own ways. Consequently, he co-founded and oversaw a new magical order, the Argenteum Astrum (“Silver Star” or A.A.), to initiate and instruct those who desired to “seek the light” of true freedom and true will. But Crowley’s task was also a public one, we must remember, and closed-door societies were not enough for the prophet of the New Aeon. Crowley’s insight coming from the Bartzabel ritual and his resulting innovation led to further technical development—and thoughts of actually staging, as a sort of play, a ritual in order to create a group “enthusiasm” later in 1910. Indeed, he wrote a ritual for public performance to invoke the moon that involved a violinist—Leila Waddell, a member of the A.A. and Crowley’s lover—and poetry written for the occasion. The event, with tickets and all, took place in August. As Francis King describes (paraphrasing the account by Ethel Archer, an attendant and friend of Crowley’s), Crowley used tried-and-true staging techniques like lighting effects, curtains/veils, and costumes along with the music, poetry, and dancing.35 Further, in a shrewd move to help include the audience, the attendants “sat on cushions scattered around the circumference of the room, all its usual furniture having been removed.”36 Apparently, Crowley’s new methods were not based on unsound opinions, as an attendant from the Sketch testifies: “We were thrilled to our very bones. […] in very deed most of us experienced that ecstasy which Crowley so earnestly seeks.”37 The writer may not “understand the ritual that runs like a thread through these meetings of the A.·. A.·.,” but he admits “that the whole ceremony was impressive” and “artistic.” We should note, of course, that the audience and performers partook of a “Cup of Libation” containing alcohol, fruit juice, and likely peyote beforehand—all in accord with Thelemic principles.38 Regardless, and as the Sketch review supports, it was apparent that magic rituals, presented in particular ways, in theatrical ways, could affect more than just the participants within the circle. They could initiate the audience, as it were. For Crowley, toiling to spread the Law and to liberate humanity from self-imposed restrictions, the ability to create such an extended effect was obviously astounding. Along with these artistic elements, the Rites also involve the audience as “the officers circumambulate the temple [in “The Rite of Saturn”] and the audience are [sic] picked at random, one by one, to join the procession, the last to do so being reminded, ‘Thou also must die!’”43 (Notably absent from the performance at Caxton Hall, for the audience at least, is the “Cup of Libation.”) That is, they are—in content, if not in quality—much like a play. Shakespeare’s Much Ado About Nothing, for instance, incorporates prose, verse, and a dance at the end, and may have thus used music as well; T. S. Eliot’s Sweeney Agonistes, a more modern example, includes verse and songs usually accompanied with music when staged. Man, unable to solve the Riddle of Existence, takes counsel of Saturn, extreme old age. Such answers as he can get is the one word “Despair”. Is there more hope in the dignity and wisdom of Jupiter? No; for the noble senior lacks the vigour of Mars the warrior. Counsel is in vain without determination to carry it out. Mars, thus invoked, is indeed capable of victory: but he has already lost the controlled wisdom of age; in a moment of conquest he wastes the fruits of it, in the arms of luxury. But even Venus owes all her charm to the swift messenger of the gods, Mercury, the joyous and ambiguous boy whose tricks first scandalize and then delight Olympus. But Mercury, too, is found wanting. Now in him alone is the secret cure for all the woe of the human race. Swift as ever, he passes, and gives place to the youngest of the gods, to the Virginal Moon. The final vision of the Rites is of powerless gods replaced by empowered “manhood,” with Pan bridging the gap between the virginal goddess and the earthly participants in the Rite by his song and his removal of the obscuring veil. Unfortunately for Crowley, the Rites, as a prophetic and artistic event, were almost a complete flop. Even Crowley, not known for his humility, admits that they failed, but for telling reasons: “I diminished the importance of the dramatic elements; the dialogue and action were little more than a setting for the soloists.”51 Although he goes on to blame the surroundings and his refusal to “condescend to theatricalism,” it is interesting that he locates the problems in the ineffective artistry, not the basic method and message of the work.52 Indeed, despite a slew of biting reviews in papers like The Looking Glass (which also made innuendoes of sexual misconduct), Crowley deems the dramatic-ritual technique “a stupendous idea.”53 Thus, when Brown says that “Crowley the playwright came into conflict with Crowley the magician,” he is not far off the mark.54 As the Rites show, and as Sutin intelligently articulates, Crowley avoided overt Thelemic language and “conveyed the teachings of Thelema without expressly announcing the Book [of the Law] or his vocation as its prophet. In this sense, Crowley was most cautious in his approach to his intended public.”55 Again, initiation and ordeals are important here: Crowley certainly dramatized the teachings in a veiled manner in the hope that the effect would serve as ecstatic propaganda to bring more “uninitiated” candidates to him for initiation and further teaching. With their bones still thrilling, the audience might surely desire to know and experience more. Whatever their theatricality, or lack thereof, the Rites were certainly intended to be a part of Crowley’s task as the prophet of Thelema. Despite Crowley’s caution with the Rites and his failed proselytizing via the theatre, when critics treat the Rites as a mere episode in a beastly life or, like Brown, leave them as an embarrassing exhibition by “a bad 19th-century romantic poet,” they impose a sense of utter failure on Crowley’s work with dramatic rituals.56 In fact, Crowley clearly took the “stupendous idea” of the mixed-genre method he used in the dramatic-ritualistic Rites and made it a fundamental principle in his subsequent work as a poet/playwright and a magician—though generally aimed at a more sympathetic and initiated audience.57 With respect to his plays published after 1910, there is a striking new integration of ritual form, best exemplified by Adonis: An Allegory and The Ship: A Mystery Play (a Mystery!). Crowley identifies Adonis (published in The Equinox I.7, March 1912) as “a dramatic ritual in the modern style,” which is interesting for tying drama and ritual together with contemporary movements in art.58 The play hearkens back to Frazer and his extended treatment of the myth and rituals of Adonis as a dying vegetation god. It also incorporates some important thematic elements of Crowley’s Rites, though the ritual aspect is not as overt in this more traditional play. The plot of Adonis involves Adonis (at first named Esarhaddon) having forgotten his “divinity” and his true wife Psyche because of the seduction of Astarte. That is, as Crowley explains in the later Argument, “Esharaddon is a man ignorant of his high destiny, lost in love of the body (Astarte) […]. The soul (Psyche) appeals to him in vain, but awakes his dread of the King of Babylon (the material plane), who is Death.”59 This part of the storyline seems to be very close to the “Riddle of Existence” and “Despair” of Saturn in the Rites, the wasted vigor of Mars in the arms of Venus, and to the subjection/death of the perfected man because of his dual nature respectively. Further, just as in the Rites, Hermes (Mercury) plays an integral role in Adonis as a Greek physician and magician who, as “the wisdom of God, leads the man to recollection of his true nature.”60 As Hermes promises in the play, “as from eclipse the sun’s / Supernal splendour springs, [Adonis’s] sight / Shall leap to light” if Psyche follows his instructions.61 And, when at last Adonis awakens from his amnesiac state, he is aware of his spiritual power—but far from chaste or otherworldly! He sings to Psyche, “I am myself, knowing I am thou,” and this “Truth […] / […] / Sets the God within the shrine / And my mouth on thine, on thine.”62 And much like Crowley has the earthly Pan tear down the veil of chaste Artemis/Luna in the Rites, Adonis and Psyche embrace rather than reject Astarte at Psyche’s insistence: “We need thee / To serve us.”63 Adonis, then, incorporates a cyclic “death” and rebirth, as in ancient rituals explained by Frazer, as its dramatic vehicle, though Crowley focuses much more on the triumphant rebirth and creative-life elements of that cycle. But it is also very close in plot and theme—liberated, spiritual, and initiated love that regenerates the material nature of humanity—to Crowley’s Rites and his essential Thelemic message. It is surprising and important that the plot of The Ship, written by the Beast 666, is disturbingly Christian in its finale, with loaded references to “I am that I am” and “the Father” and “Son” and “Holy Spirit.”70 But Crowley’s use of this language is appropriate in two ways. First, The Ship is his expression “in dramatic form” “of the central mystery of freemasonry,” and freemasonry is essentially a Christian movement.71 Second, Crowley often adopts Christian language in an ironic fashion, as is surely the case here in his drama of the return of spring. By tying the Christ myth to the ancient vegetation-god myth, Crowley seeks to expose the former as a version of the latter (much like Frazer’s evidence tacitly does). And, truth be told, Crowley never escaped the Christianity of his youth, no matter how hard he tried to rebel against it; it appears constantly in his artistic and other writings. Combining all of these elements, The Ship is a strikingly ritualistic drama—or dramatic ritual—that exemplifies Crowley’s post-Rites approach to magic. At the same time, like Adonis, it also exemplifies how this approach was harmonious with his prophetic task, for it expresses some of the key principles of Thelema: passing through an initiating ordeal or ritual “death” to be reborn as the perfected child of creative energy. Alongside these more artistic endeavors after 1910, Crowley also continued to follow the technique he used in the Rites by marrying ritual and drama in his strictly (in intention) magical rituals, both for individual and group work. Liber XLIV: The Mass of the Phoenix, first published in 1913 as part of Crowley’s The Book of Lies, is a Thelemic ritual again celebrating the renewal of the perfected individual after consuming his/her own material nature—the mythical phoenix rising from its own ashes.72 What is worth noting in this ritual is that, along with the use of signs, magical instruments, and even a bell, Crowley sets the speech in rhymed couplets. “There is no grace: there is no guilt: / This is the Law: Do What Thou Wilt!” the magician states; then, after striking the bell eleven times for emphasis, he/she cries “I entered in with woe; with mirth / I now go forth, and with thanksgiving, / To do my pleasure on the earth.”73 Liber V vel Reguli, written c. 1921, uses other, more dramatic forms in a different way.74 This ritual, an interesting Thelemic adaptation of older Golden Dawn rituals, includes a “Spiral Dance” to arouse the enthusiasm of the magician, though it “may be omitted” depending on the aim of the working.75 Liber V is also significant because Crowley originally used it for group working at his Abbey of Thelema in Cefàlu, Sicily, later applying it to individual work as well.76 In The Mass of the Phoenix and Liber V, then, we see Crowley continuing to mix genres/forms in his magic—ritual and poetry in the former, ritual and dancing in the latter—in accordance with his belief in the efficacy of that approach and its usefulness in a Thelemic system of magic. This new shift in Crowley’s magical direction is crucial to his later work and reputation (as a drug-crazed sexomaniac), so a little background for the Gnostic Catholic Mass may be helpful here. As Crowley recounts in his Confessions, he was put in charge of rewriting the rituals of the O.T.O., which he calls “dramatically worthless” when naming their faults.78 But, to Crowley, the heart of the Order’s teachings was of great value, and (with a little revision) harmonious with Thelema. The Gnostic Catholic Mass is just one of the many O.T.O. rituals that Crowley wrote in the years after he took over the order (under the name Baphomet), and it is still performed by various O.T.O. offshoots. Crowley speaks to the communal nature of the Gnostic Catholic Mass, a ceremony to satisfy “the religious instinct,” and explains that in it he aimed “to construct a ritual through which people might enter into ecstasy as they have always done under the influence of appropriate ritual.”79 Much like its orthodox Catholic counterpart, even including a sacrament of wine and “Cakes of Light,” the Gnostic Catholic Mass is truly remarkable even on paper with the elaborate decorations of the temple, the rich attire of the participants, the accompanying music, and the multi-lingual speeches and aves punctuating the ceremony.80 However, Crowley incorporates verse at key points in the ritual, such as during the “Consecration of the Elements” (section VI) when the priest makes the blessing/transubstantiation of the Cakes (“By the virtue of the Rod / Be this bread the Body of God!”) and the wine (“By the virtue of the Rod / Be this wine the Blood of God!”).81 And for the poetic “Anthem” that closes the ceremony in a flourish of poetic exaltation, Crowley used the final lines of his play The Ship, that dramatic ritual celebrating the return of spring and the creative rebirth of life. The Gnostic Catholic Mass thus seems to serve as the success that Crowley sought but failed to find in The Rites of Eleusis. It is his grandest work of dramatic ritual, a ceremony of community in which the officiating “actors” lead the audience through a musical and poetic experience to equally induce and celebrate the ecstasy of liberated life—of life under the Law of Thelema, whose yoke, Crowley proclaims, is hard won but light. One final example of Crowley’s use of ritual and drama in terms of magical work worth looking at is his Magick, an encyclopedia of occultism that is impressive in its scope and depth. The book consists of four parts: “Mysticism,” “Magick (Elementary Theory),” “Magick in Theory and Practice,” and “ΘΕΛΗΜΑ: The Law” (which includes the text of The Book of the Law). Part III is of particular interest here, for in it Crowley first lays out his definition of “MAGICK” as “the Science and Art of causing Change to occur in conformity with Will” and then gives its theoretical and practical principles.82 Now, Crowley began writing part III with Leila Waddell (the violinist in the Rites) as amanuensis c. 1912, he advertised it in 1913 in The Equinox, he made the first typescript of it in 1921 while at his Abbey, and he finally published it in 1929-30.83 As we can see, Crowley’s work on this part of Magick began shortly after his staging of the Rites and coincided with his involvement with the O.T.O. Thus, in writing his Thelemic-magical “textbook” for the world of interested students of the Mysteries, Crowley codifies the theories of dramatic ritual that he had been practicing since 1910. In chapter 1, “The Principles of Ritual,” he defines “the object of all magical ritual” as “the uniting of the Microcosm with the Macrocosm. The Supreme and Complete Ritual is therefore the Invocation of the Holy Guardian Angel.”84 That is, the ultimate aim of all proper rituals is the very thing that he made it his task to teach in the wake of The Book of the Law. Also in this chapter, he gives the “Third Method” of invoking a deity as “the dramatic, perhaps the most attractive of all” in its ability to create “sympathy” (i.e., identity) with the deity.85 Besides his equation of art with magic quoted above (from chapter 10, “Of the Gestures”), Crowley devotes chapter 19 to “Dramatic Rituals.” Here, he again speaks to the force obtained from harmonious group work (which dramatic rituals best provide), the necessity of a “well-skilled poet” to compose the “story,” a ritual climax, and then a final “impromptu” that has as its “most satisfactory form” a dance.86 Although this chapter is only two pages long, it is a virtual summary of the principles that Crowley had developed, practiced, and found successful since 1910. Clearly, if he feels confident enough to make the married dramatic-ritual technique that we have been examining part of his most scientific, delineated, and serious treatment of magic, then he must have been convinced that the singular failure of the Rites did not nullify his “stupendous idea.” Indeed, he seems to have been otherwise convinced of its efficacy for the remainder of his life: he continued to write, act, and publish as poet, magician, prophet, and Beast. Whether or not one accepts Crowley’s system of Thelemic Magick, with its gods and doctrines of liberated ecstasy, or Crowley himself as the self-convinced prophet of a new Law, it is irrefutable that he was prolific in his efforts to operate in accordance with that system. Moreover, he continued to work in the public’s often-critical eye as the Beast 666, engaging his talents as writer, magician, and eccentric in order to make the Law available to all. Crowley was convinced that human perfection requires liberating the self from restriction and entering a state of child-like energy, and that such perfected energy was in its essence ecstatic and artistic. Consequently, he developed and applied a technique of dramatic ritual, almost a genre in itself, which married all the conventions of magic and all the conventions of drama in order to unite the microcosm and the macrocosm, the higher and the lower self, through an experience engaging all of the faculties. Through his early success with his dramatic-ritual form, his failure with the public Rites of Eleusis, and his continued reworking of his “new methods of Magick,” Crowley enacts his basic prophetic creed that “All Art is Magick,” that all magic is liberating, and that liberation is the right of all humankind. 1 Aleister Crowley, with Mary Desti and Leila Waddell, Magick: Liber ABA. Book Four. Parts I-IV, ed. Hymanaeus Beta, rev. ed. (York Beach, Maine: Samuel Weiser, Inc., 1997) 197; Crowley’s boldface. 2 James George Frazer, The Golden Bough, abridged ed. (New York: Collier Books-Macmillan Publishing Company, 1963) 448. 3 Ibid. In addition to this mythical-magical relationship, Frazer also recognized the development and succession of science out of the “superstitions” of the past (see the final chapter of The Golden Bough, “Farewell to Nemi”). Crowley presents a similar view with his system of “Scientific Illuminism,” mysticism practiced along scientific lines. 4 See Crowley, Magick 793 and 795. 5 Aleister Crowley, “Eleusis,” The Collected Works of Aleister Crowley, vol. 3 (Foyers, UK: Society for the Propagation of Religious Truth, 1907; Des Plaines, Ill.: Yogi Publication Society, n.d.) 230. 6 Qtd. in Robert Ackerman, The Myth and Ritual School: J. G. Frazer and the Cambridge Ritualists, Theorists of Myth, ed. Robert A. Segal (New York and London: Garland Publishing, Inc., 1991) 153. 7 For instance, Yeats’s Rosa Alchemica contains a ritual climax relying heavily on the Golden Dawn. However, Yeats’s works are not meant to be rituals themselves, nor do they support a system and cosmology, as Crowley’s do. 8 See J. F. Brown, “Aleister Crowley’s Rites of Eleusis,” Drama Review 22.2 (1978): 11-2. 9 See also Israel Regardie’s The Golden Dawn for a more complete edition of Golden Dawn rituals and teachings. 10 See J. F. C. Fuller, with Allen Bennett, “The Temple of Solomon the King. Part II,” The Equinox 1.2 (Sept. 1909), in vol. 1 (York Beach, Maine: Samuel Weiser, Inc., 1998) 244-61. 11 Fuller 257 and passim. 13 Originally titled Liber L. vel Legis, the title changed to Liber AL vel Legis c. 1919. It is conventionally referred to by its English title, The Book of the Law. 14 See Aleister Crowley, The Confessions of Aleister Crowley, eds. John Symonds and Kenneth Grant, 2nd ed., (1929; London and New York: Arkana-Penguin Books, 1989), and Magick part IV, passim, for detailed discussions of the reception of The Book of the Law, the gods and beings it describes, and the principles of Thelema it contains. 15 Crowley’s remark on the progression of human civilization underlying this cosmology evidences the importance of the Golden Dawn to his later work: “The Neophyte ceremony of the Golden Dawn prepared me for the New Aeon [of Ra-Hoor-Khuit]; for, at the Equinox, the officer who represented Horus in the West took the throne of Osiris [the “Dying God” of the previous aeon ending with The Book of the Law] in the East” (Crowley, Confessions 399). 16 Aleister Crowley, “Liber L. vel Legis svb figura CCXX as delivered by LXXVIII vnto DCLXVI” [The Book of the Law], The Equinox 1.10 (Sept. 1913), in vol. 2 (York Beach, Maine: Samuel Weiser, Inc., 1998) I:15, p.12. 17 Ibid. I:39, I:40, I:41, p.14. 19 Ibid. I.34, p. 14; emphasis added. 20 Ibid. I:38, p.14 and passim. 21 Ibid., II:60, p.23. As I will discuss further below, Crowley was so troubled by this part of The Book of the Law that he shirked and even rejected his office as its prophet for many years; his final acceptance of it in 1909 is both significant and timely. 22 Qtd. in Crowley, Magick xxxviii. 25 Qtd. in Crowley, Confessions 516. 26 Crowley, The Book of the Law I:3, p.11. 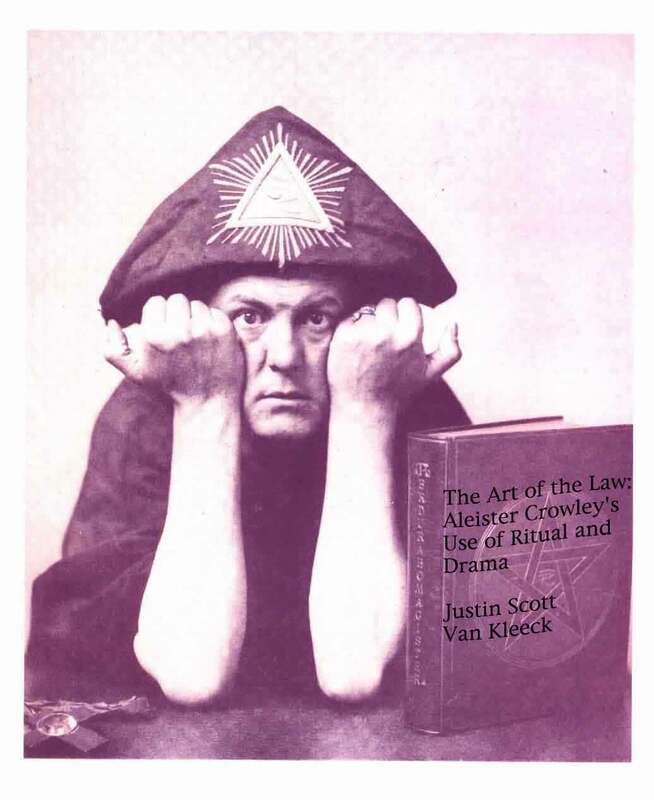 32 Lawrence Sutin, Do What Thou Wilt: A Life of Aleister Crowley, (New York: St. Martin’s Press, 2000) 193. 33 Crowley, Confessions 630; emphasis added. 34 Crowley, Magick 197; Crowley’s boldface. 35 Francis King, The Magical World of Aleister Crowley (London: Wedenfield and Nicolson, 1977) 62-4. 37 Qtd. in Crowley, Confessions 32. The writer, Raymond Radclyffe, was “an admirer of Crowley’s poetry” (Sutin 210) but apparently not Crowley’s disciple. 38 See Sutin 210 and King 63. 40 Ibid. 633. Although Crowley bases this claim on the content of the “masonic rituals” he was using at the time, his opinion of ancient customs virtually echoes the entirety of Frazer’s The Golden Bough. Jane Harrison’s works (Themis and Ancient Art and Ritual) and those of the other Cambridge Ritualists, published after the Rites were performed, also lend credence to Crowley’s statement. 47 See Frazer 456ff. for a discussion of the Greek Rites. 48 See Crowley et al., The Rites of Eleusis pp.14 and passim. 53 Ibid. 638. Crowley’s friend George Cecil Jones sued The Looking Glass for libel, as Crowley’s other acquaintances urged him to do, but lost the case (see ibid. 635 et al.). 55 Sutin 210. Some of the most direct references to Thelemic principles come in “The Rite of Mars,” with lines such as, “Crowned child and conquering Lord! / Horus, avenger!” (p.51); though not overt, the Thelemic system is still pervasive. 57 For purely “secular” theatre, Crowley took Waddell and other women performers on tour in England and Russia as “The Ragged Ragtime Girls.” See Crowley, Confessions 690 and 711, and Will Ryan, “The Great Beast in Russia: Aleister Crowley’s Theatrical Tour in 1913 and his Beastly Writings in Russia,” Symbolism and After: Essays on Russian Poetry in Honour of Georgette Donchin, ed. Arnold McMillin (London: Bristol Classical Press-Gerald Duckworth & Co. Ltd., 1992), passim. 59 Aleister Crowley, “Notes and Corrections,” The Equinox 1.10 (Sept. 1913), in vol. 2 (York Beach, Maine: Samuel Weiser, Inc., 1998) 30. 61 Aleister Crowley, “Adonis: An Allegory,” The Equinox I.7 (March 1912), in vol. 2 (York Beach, Maine: Samuel Weiser, Inc., 1998) p.147. 65 Aleister Crowley, “The Ship: A Mystery Play,” The Equinox I.10 (Sept. 1913), in vol. 2 (York Beach, Maine: Samuel Weiser, Inc., 1998) pp.59-60, 61-3. 66 See ibid. pp.70, 73-4. 72 E.g., its “Cakes of Light” follow the recipe given in The Book of the Law III:24: “meal & honey & thick leavings of red wine: then oil of Abramelin and olive oil, and afterward soften & smooth down with rich fresh blood” (Crowley, The Book of the Law p.27). 73 Aleister Crowley, “Liber XLIV: The Mass of the Phoenix,” in Magick (op. cit.) 572. 74 See Crowley, Magick 772-73. 75 Aleister Crowley, “Liber V vel Reguli,” in Magick (op. cit.) 575. 76 See Crowley, Magick lxi. 77 Although Crowley began announcing the O.T.O. as early as 1912 in The Equinox I.8 and again in I.9, he was reticent to reveal the “wisdom,” sexual in nature, which the Order taught and practiced. Crowley offers tantalizing hints of the secrets in Confessions. He states, “I am always ready to communicate them to inquiring Brothers” (706), and he admits that he could give them and appropriate rules “without doing much harm” (709), but he never does so. Perhaps the efficacy of sexual magic, having impressed Crowley so deeply, and combined with the attacks on his character growing out of his staging of The Rites of Eleusis, led him to focus more on the “ordeals” and “half concealed” rituals of The Book of the Law as necessary preparations. Whatever his motivations for this secrecy, Crowley continued to publish his magical works and to remain in the public sphere as the prophet of Thelema, preaching the Law to all, up until his death in 1947. 80 See Aleister Crowley, “Liber XV: O.T. O. Ecclesiæ Gnosticæ Catholicæ Canon Missæ” [The Gnostic Catholic Mass], in Magick (op. cit.) 584, 593-94). 81 Ibid. p.593; admittedly, these couplets are less than “ecstatic” poetry. 82 Crowley, Magick 126; Crowley’s boldface hereafter unless otherwise noted.